perfect happiness; great joy: she gave a sigh of bliss. The resident pair of monogamous fish eagles called just before sunrise as I painted on the final brushstrokes of my make-up. The light changing from the deep pre-dawn quiet to the warm and rich golden glow of daybreak. There was a slight buzz in the air, a static of excitement that filtered through and settled over everything like a fine layer of sparkly dust. Even the morning chorus seemed aflutter. Fresh and clean was the first light air as we made our way from the Bailey’s Banda where I got dressed, over the bumpy 4×4 tracks, towards the Msini River Valley, and made a sharp left into an almost nonexistent path, the aroma of crushed vegetation crisp as we drew near. Hanging jars of summery flowers on Shepherds staffs and bunting dancing in the breeze set the scene; the amble down the aisle in time with John Legend’s All of me with my dad is a walk I will forever cherish, the violin strings of Lindsey Stirling pulling on everyone’s heartstrings. Walter and I got married beneath the lofty limbs of a beautifully gnarled Fig Tree, hundreds of years old, in the middle of the forest in an area we call ‘butterfly alley’. It was perfect. We had a choir of baboons gleefully chirping in the background and a myriad of white butterflies flitting from blossom to bloom. 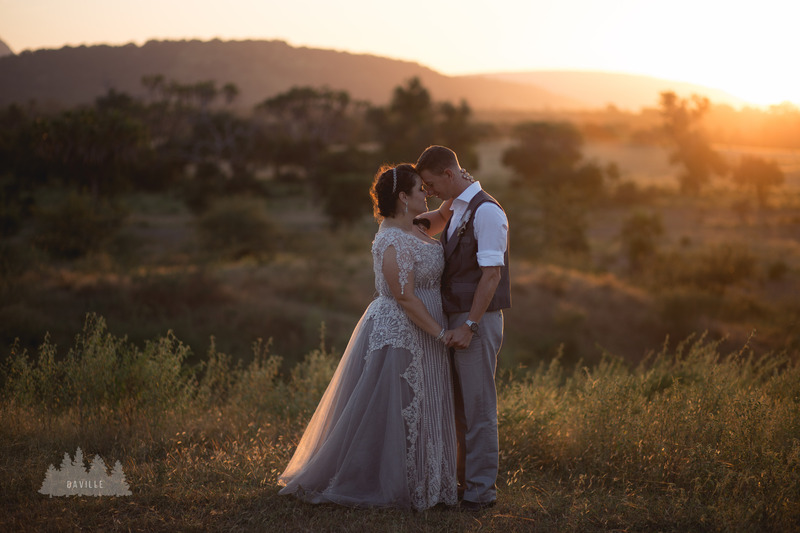 Witnessed by an intimate gathering of our beloved family and friends in their ‘Out of Africa’ attire, we said our vows and exchanged the rings under the dappled light and the open sky. Following the eloquent ceremony which was led by my brother in law, Vincent, we moved over through a shoal of iridescent floating spheres to another gracious Fig where the breakfast station was spread out and the family photographs were taken; the tunes of Etta James and the Beatles playing in the background. After a leisurely game drive back to camp, everyone changed into cooler dress and a light lunch was served down in the lookout banda. The kitchen did exceptionally well, coping with a full camp right at the beginning of the season and I puffed up like a proud mama hen, I was so very proud. To have our South African Family meet and sample the fruits of our Tanzanian Beho Beho Family. Good old home cooking, comfort food made from the heart. As it was such an early start to the day, we all scattered and the camp hushed over in the midday heat for a nap after lunch, and we reconvened in the main area for the cutting of the cake at afternoon tea. Some good laughs were had and everyone dispersed again for an afternoon activity while Walter and I went with the photographers to make the most of the beautiful afternoon light for the photo album. A glitzy glamorous black and gold decorated main camp awaited us for the soiree, everyone decked out in 1920’ inspired Great Gatsby garb, flapper dresses and fedoras all around whilst we listened to a few impromptu speeches that had everyone in stitches and in tears before we sat down for the main event. Once again the kitchen did a marvelous job. Everything went off without a hitch and the dessert was a hit – white chocolate cheesecake which is my favourite sweet treat, but this time dressed up in beautiful edible black lace and a golden sugar brooch on top. Hey, it is my wedding day – I had to show off just a little bit;). Dinner was followed by the first dance underneath the stars, lanterns lighting up the parade ground, and Van Morrison’s These are the days was a very fitting choice. Although my nerves played up and I made a few mistakes, I think it went ok and nobody really noticed it under the layers of tulle and lace! Then the Father-daughter dance to Bruce Springsteen’s When you need me. We left the party just before midnight in true fairytale style, although I think the rest of the group followed soon after – the four day wedding safari drawing to a close; all thoroughly sated. Walter and I are so blessed and grateful for the opportunity to share our special day with both halves of our lives: our nearest and dearest from our homeland as well as the Tanzanian family we have come to love over the last four years, right here in the Selous. Our sincerest heartfelt thanks goes out to those who made the day so special, who worked so hard to get everything ready in time and contributed to the massive success of the entire day, each in their own way – we will carry these spectacular memories with us until the end of our days. This entry was posted in Karin, Walter and tagged Beho Beho, camp, Karin, safari, selous, walter, Wedding. Bookmark the permalink. Thanks so much for your well wishes – it is much appreciated:). Hope all is well your side and look forward to seeing you again soon! Thanks a lot! It was blissful. What wonderful photographs! We both wish Walter and Karin much happiness for the future. We well remember their first visit to the camp all those years ago and it has been great to see them twice since then and to see what they have achieved at Beho Beho. We only wish we could come back more often! Thanks so much Christine & Tony! We appreciate the kind words, it was a magical day. Yes, quite a journey from those first few days on interview… You’re most welcome back, we’d love to host you again! Wonderful news! Congratulations to you both! We hope to come back one day, we cherish our memories! Thanks so much, it was a fairytale indeed. We’ll release the video webclip as soon as we receive it so everyone can see:). You are most welcome back – karibu tena! Hi Rachel, it was a wonderful day! We’ll definitely pass on your regards to all the Beho Beho Family:). Thanks for the warm wishes – we appreciate it! Hope all is well with you, and welcome back to Beho Beho. Thank you for sharing your fabulous day with us. We’re happy you enjoyed reading it – our pleasure! Perfect couple in a perfect place, congratulations. Hope all is well with you and welcome back! *Barbara – my apologies fot the typo! a lovely day for you all and some very nice prose – thanks for sharing. Thanks so much for the message and complement, it is much appreciated! Hope you’re doing well and karibu beho beho! 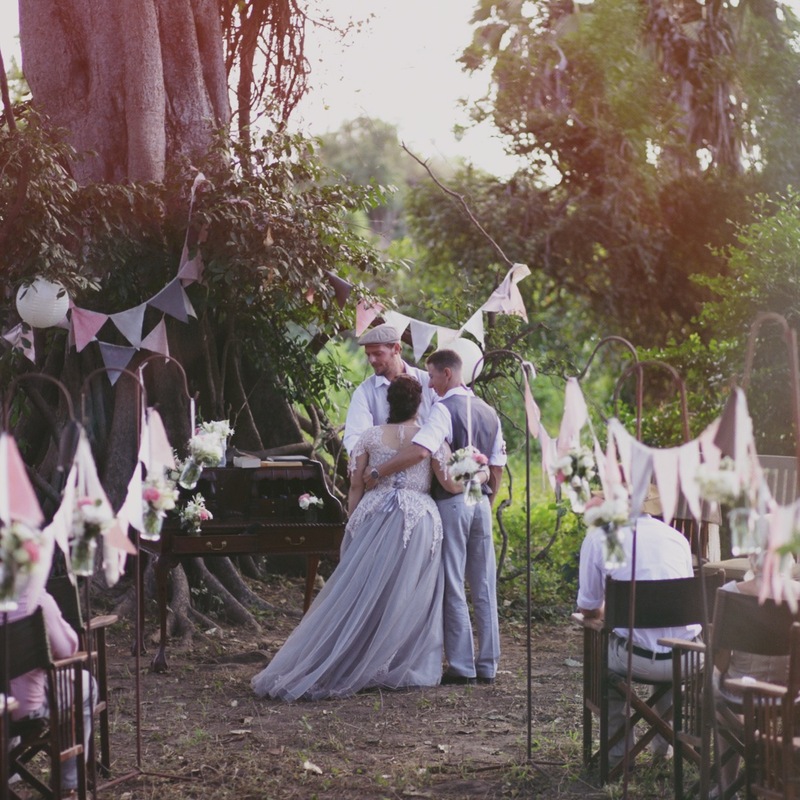 We can not imagine a more perfect wedding in a more perfect setting for a more perfect couple. Congratulations! All our best wishes, we’ll never forget Beho Beho! P.S. Karin, you are a wonderful writer, you brought tears to my eyes reading about your magical place, I hope you’ll write a book on Africa – Beho Beho – one day! Thank you so much for the wonderful complements and kind words, we appreciate it from the bottom of our hearts! You are most welcome back to Beho Beho – we would love to host you again! Fantastic news and it looks like it was a perfect day. Congratulations to you both and may you have many years of happiness together. See you all soon hopefully. Well, we’ve got a head start beginning our married life in such a wonderful setting as this! Thank you very much and look forward to seeing you all again. You are most certainly very welcome back to Beho Beho, and we’re very happy that you think about the magical place that Beho Beho is so often! Thanks for the lovely words, and hope to see you again soon. Thank you so very much for this delightful email with the news of Walter and Karin’s wedding and the photos. So nice to read and see the wonderful day, and the great memories reflecting on our last visit to Beho Beho. How we hope for one more visit! jCongratulations to the happy couple and this also comes with our best wishes much love and may all their dreams come true! Walter and I sincerely appreciate the wonderful words above, thank you so much for all the well wishes. We would love to host you at Beho Beho again – you are most welcome back! I counted down the days to the wedding day on that beautiful calendar of canada you sent. Thanks so much! We hope you are both doing very well and hope to see you again soon! Congratulations and all the very best for your life together. Thank you for sharing your very special day with us. The photos are amazing and your ‘Wedding in the Wild’, Karin, was beautiful. It sounds as if you had a truly wonderful day in a magical place. Thank you so much for the congrats – it was indeed beautiful, thanks! Hope all is well with you and very welcome back! What stunning pictures and fantastic news ! breathing of Mother Nature and all your loved ones . warmly….in 2 weeks time ! It has been an absolute pleasure, once again, having you stay with us at Beho Beho – so many laughs and great conversations around the dinner table beneath the starry tanzanian night sky. Memories to cherish forever. Thank you so very much for the beautiful and kind wishes – you are right, there was no better place indeed. We hope you have had a good journey home. You are most welcome back, and we hope to see you again soon. For both of you there was certainly no better place to celebrate your love….surrounded by the breathing of Mother Nature and all your loved ones. We wish you all the best for a wonderful life together and are looking forward to hugging you warmly…in 2 weeks time.